UPDATED at 8:45 PM Monday, June 19th. At the request of 14th District Attorney General Craig Northcott, TBI Special Agents are investigating the circumstances surrounding a Monday afternoon shooting that left two Coffee County deputies injured. Preliminary information indicates the incident began just before 3:00 PM, when Coffee County Deputy Wade Bassett, 71, went into the holding cell on the third floor of the Coffee County Justice Center to take inmate Michael Eugene Bell (DOB 12/8/1979) back to the jail. Bell had been in court that day for a discussion date regarding kidnapping, domestic assault and multiple other charges he faced. As the deputy prepared to get Bell for transport, Bell attacked him, and the two engaged in a significant struggle. The inmate was able to gain control of the deputy’s weapon, and shot Deputy Bassett one time before fleeing down the stairs. When he got to the first floor, Bell shot Deputy Wendell Bowen, 56, on his way out the door. The early investigation shows that after fleeing the Justice Complex, Bell ran about a block away, entered and then exited a home on Madison Street. He then fled to a yard at an adjacent home, where he was found deceased from a self-inflected gunshot wound to the head. Deputy Bassett, who was wearing a bullet-proof vest, sustained significant hand and arm injuries, as well as injuries sustained from the bullet striking his body armor in the abdomen area. He was transported to Vanderbilt University Hospital, where earlier tonight he was listed in stable condition. Deputy Bowen was shot in the abdomen area, and was transported to Erlanger Hospital, where he was undergoing surgery earlier in the evening. The TBI currently has Agents gathering relevant information, interviews, and evidence in connection to this active and ongoing case. The Violent Crimes Response Team vehicle from the Nashville office, with several Special Agent/ Forensic Scientists, will work through the night to collect evidence. All investigative findings will be submitted to District Attorney General Northcott for his further review and consideration. 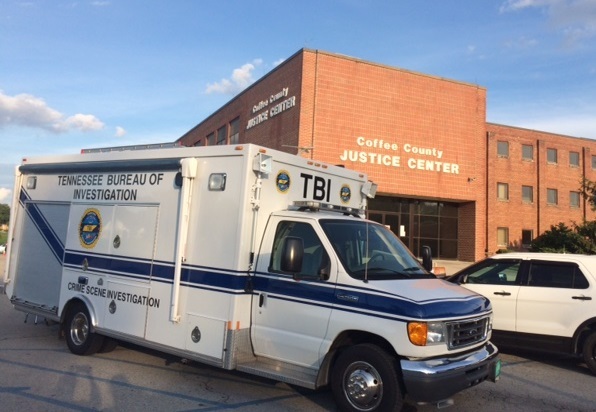 General Northcott announced that due to the investigation going on at the courthouse, the Coffee County Justice Center will remain closed on Tuesday. Updates on this investigation will be posted online at TBINewsroom.com.